Incidentally, you have a great Xcelsius site! I was trying to acheive the same functionality as the WSJ Calculator. I’m sure there are other ways too. BTW, Im a big fan of yours, Thanks for the Dummies, Best Practices and Escape. XJ is an amazing resource and reference too. Great minds must think alike! I had actually build a similar application for a customer, but it looks like it never saw the light of day. It really shows the value for building calculator applications. The blog looks great. This is Awesome, 2 of my favorite and by far the heavyweights in Xcelsius appreciating on the same day. I consider myself lucky. Yes, i agree, with some basic Excel logic and Xcelsius components one can easily build cool calculators and utilities. Currently am plan to get more knowledge in Crystal xcelsius Dashboard. 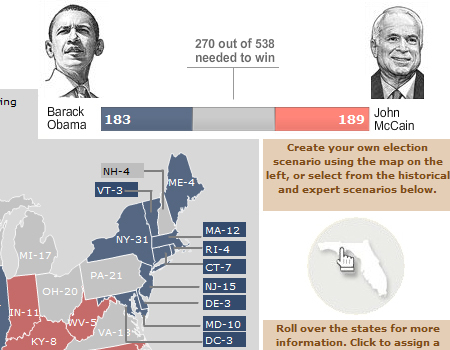 I Saw the “Yahoo Election08 Political Dashboard” (12ways topickyour new President ), its really amazing. and also am wondering, when i move the mouse over the city in the map , it is popup a menus with image and same progress bar also. can you help me on this … what kind of compenent of xcelsius was used here. Thanks. Although Xcelsius has great features to represent data visually, some minor beautification elements are missing. One of them is the tool tip function when hovered over a map component. This is there in Charts, but I would like to see this feature extended to Maps and other components too. The Yahoo Electoral Dashboard is from Yahoo, it was not built using Xcelsius. I compiled all those dashboards since I focus on Visual Data Analytics, it need not be Xcelsius Visualizations. However if you go to the Showcase page and click on the Electoral Map, that was built using Xcelsius and it does not have the tool tip feature as yahoo and other dashboards. Good luck for your Xcelsius Endeavor. Let me know if you need any help. This is a cool dashboard. Is it possible for you to share the techniques that you have used?